The OMEGAROMETER Series accelerometers are one of the best accelerometers designed for industrial vibration measurements. 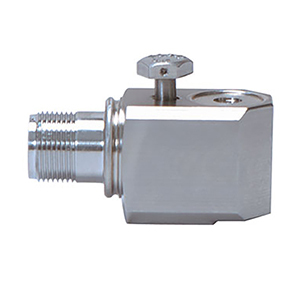 These accelerometers feature a hermetically sealed 316L stainless steel case suitable for harsh environments. The ACC787A is a general purpose accelerometer with a low profile side cable exit. 1 To minimize signal distortion when driving long cables or high-vibration signals, 24 to 30 Vdc powering is recommended. The higher-level constant current source should be used when driving long cables. 2 A maximum current of 6 mA is recommended for operating temperatures above 100°C (212°F). 참고: ACC787A includes captive mounting screw and calibration data. Specify cable separately, see Accessories. ACC787A + ACC-CB7-10 + ACC-B3 + ACC-PS2, is a typical accelerometer system.